With New Orleans out of the way, I am doing several Seminole War related projects. I am now on the board for the Seminole War Foundation. We have a few exciting things that are coming up. This April or May, we will publish the Florida Seminole War Heritage Trails booklet. This is being produced by a grant from the Dept. of State, and will be a free publication available in museums and welcome areas across the state. It will be 40 pages, full sized 8.5" x 11" booklet, with about 40 or 50 sites you can visit all over Florida. Museums, historic battle sites, or some very interesting places you might not have known about. Plus, we have listed what must be about 100 historical markers. And to make it look really nice, Jackson Walker is doing the artwork for the book. You cannot believe how excited I am over this project. I have wanted to have something like this made for 20 years. But instead of just myself, and I am one of the writers, we also have contributions by Dr. Joe Knetsch, Frank Laumer, Patsy West, and Pedro Zepeda. John and Mary Lou Missall get the credit for most of the work, and have logged 5,000 miles on their car visiting all these places. Here is one place I photographed a week ago: The town of Volusia along highway 40, along the St. Johns River, bordering Lake and Volusia County. 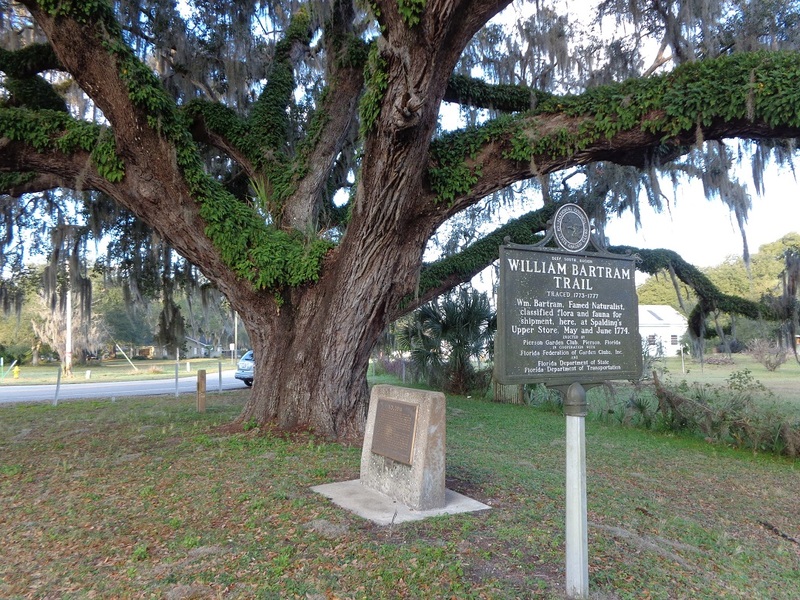 This magnificent oak has a marker under it, telling of the history of the community of Volusia, which dates back to Spanish settlement, possibly before St. Augustine. At one time, local resident Lillian Gibson, had a museum in her house full of local artifacts and interesting objects, known as the Volusia Museum. She passed away about a dozen years ago, and I was pleased to see a small marker remembering her next to the Volusia Marker. Of course, you notice the William Bartram marker here as well. 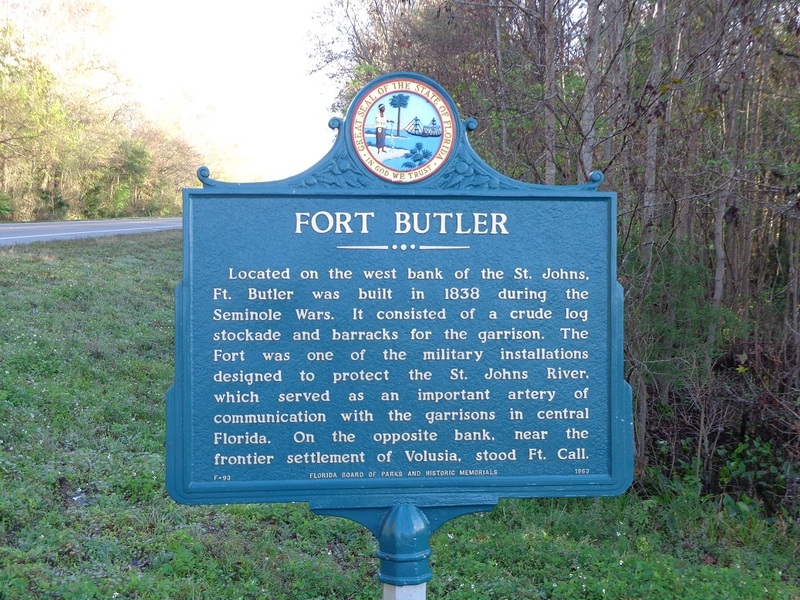 Volusia was an important crossing during Seminole War times, and there were several forts here. Forts Volusia, Call, Butler, Barnwell, are what come to mind. 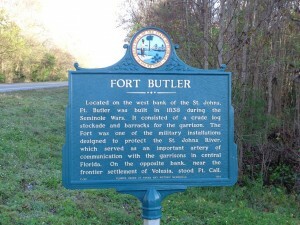 Nearby across the river on the Lake County side, is this historical marker for Fort Butler. So this is just one place for the booklet. Now, with 40 pages and about 150 places mentioned, we don't have a lot of room for photos, and we want enough space for Jackson Walker to make it look good. So what John Missall is planning, is to make a slide show of all the places John and Mary visited. That will be a program that I will be interested in seeing! We are just about finished on the book, and expect publication in April, or May at the latest. I think that we have visited all the sites and almost everything is written up. We are busy proofreading each other. But also stop by and listen to the stories. It was an adventure just finding some of these places. Historical markers, especially. Those rascals have a habit of moving around, or even disappearing. Or hiding. One of the more interesting examples was finding the marker for Fort Peyton southwest of St. Augustine. You will have to ask John and Mary about that story! For upcoming events for the Seminole Wars Foundation, I believe that John and Mary Lou will be at the Battle of Okeechobee. Then with myself at Fort Cooper. wonderful news about the booklet! Looking forward to it! I think that there will also be a website where you can download the book as a pdf file.